Researchers probing the complexities of Alzheimer's disease have detected issues involving cellular energy production, and those problems may be an important contributor to the late-onset form of the illness. A team at Harvard-affiliated McLean Hospital tested the cells of late-onset Alzheimer's patients and found malfunctions in their energy production, including problems with the health of their mitochondria, the cellular power plants that provide most of their energy. Bruce Cohen, director of McLean's Program for Neuropsychiatric Research and the Robertson-Steele Professor of Psychiatry at Harvard Medical School (HMS), said disrupted energy production would present particularly severe problems in the brain, because it is the body's most energy-hungry organ, demanding as much as 20 times the energy of other tissues. Such a malfunction, he said, could damage or kill nerve cells and help explain the cognitive decline associated with the disease. Much of the scientific attention focused on Alzheimer's has centered on what's called the amyloid cascade hypothesis. That suggests that a protein called amyloid-beta forms plaques in the brain, triggering tangles made up of a second protein called tau, which sets off the inflammation that destroys neurons and leads to Alzheimer's signature cognitive decline. "I do think there's a need in the field to look at different angles," Sonntag said. Lending additional complexity to the Alzheimer's picture are differences between its two forms: early onset—which, though relatively rare, has been intensively studied—and late-onset, which accounts for 95 percent of the cases. Early onset Alzheimer's is a particularly severe form that runs in families whose members develop the disease in their 50s and early 60s. It has been traced to a handful of genetic mutations that produce heavy loads of amyloid plaques in the brain. 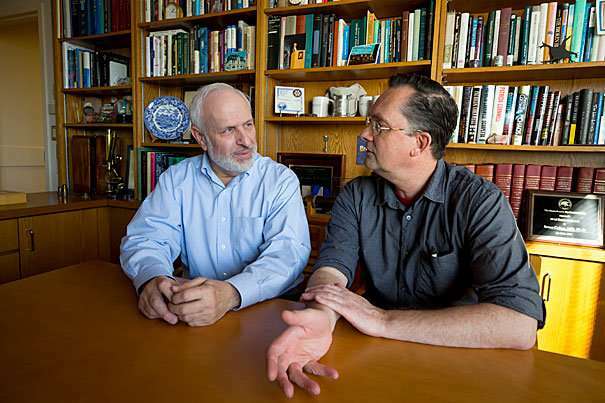 Insights from early onset Alzheimer's have informed medical understanding of the disease more broadly, while the identified genetic mutations have been used to create mouse models of the ailment so it can be better studied in the lab, Sonntag said. But it's possible that lessons from those studies may not neatly apply to the late-onset form, called sporadic Alzheimer's, which typically strikes after age 65, Sonntag said. While the two forms of Alzheimer's share many features—including heightened risk if there is a history of Alzheimer's in the family, the development of plaques and tangles in the brain, and the hallmark cognitive decline—Sonntag and Cohen said late-onset Alzheimer's could be an aberration of the normal aging process. "You could say maybe sporadic disease isn't like early onset disease, but a reflection of abnormal aging," Sonntag said. "Every aspect of Alzheimer's disease you can [also] find in normal aging. Accumulation of [amyloid]-beta occurs in all of us, phosphorylation of tau, all these things. Even when you look at post-mortem brains, there's a high percentage of people with high levels of [amyloid]-beta, but who are not demented. There's no 100 percent correlation between accumulation of plaque and Alzheimer's disease, even when you look at post-mortem brains." The work grew out of Cohen's prior research, which looked at the role of cellular energy dysfunction in psychiatric diseases. With aging also marked by reduced cellular energy production and Alzheimer's, particularly the late-onset form, tied to aging, it was a short leap to wonder whether dysfunctions similar to those seen in psychiatric disorders might contribute to Alzheimer's, Cohen said. "Energy production and use seem to be one thing that goes wrong [in cells] as we get older," Cohen said. "We do see changes with aging, and we do see changes that are shared with aging and Alzheimer's, but also some changes that are specific to Alzheimer's." In work published recently in the journal Scientific Reports, Cohen, Sonntag, and colleagues at McLean took a type of skin cells called fibroblasts from late-onset Alzheimer's patients and compared their energy production with those of age-matched controls without Alzheimer's. Because energy metabolism is largely genetically determined, it's likely that what was occurring in the fibroblasts was replicated throughout the body, including the neurons. Cells typically produce most of their energy (88 percent) through mitochondrial respiration, which takes place inside a cell's mitochondria. A smaller amount (12 percent) is produced through a process called glycolysis. The researchers showed that skin cells from late-onset Alzheimer's patients had impaired mitochondrial metabolic potential and shifted their energy production toward glycolysis to compensate. The brain, however, is not only energy-hungry, its neurons are handicapped compared with fibroblasts, according to Sonntag. That's because neurons make energy primarily through mitochondrial respiration, and so don't have the process of glycolysis to fall back on. That means impaired mitochondrial respiration could result in the death of neurons, which could help explain Alzheimer's cognitive decline. If energy dysfunction is shown to play a role, Cohen said, it's likely just a piece of the Alzheimer's puzzle, one affected by multiple factors interacting in complex ways to provide outcomes that differ in various patients. "Although people hope with a lot of these conditions we study—normal or abnormal—that there are going to be simple answers … it's never simple, it's always all kinds of factors interacting to determine whether you get lucky or not, whether you get sick or not," Cohen said. The next step, Cohen said, will be to do a similar study on the neurons and other brain cells of Alzheimer's patients, to see whether the energy dysfunction detected in skin cells is replicated there. Even if medical understanding of the disease remains imperfect, Cohen said the ultimate hope is to find an intervention that interrupts Alzheimer's most devastating effects. "You don't have to fix everything to keep somebody from getting sick," Cohen said. "The reason somebody gets sick is you're unlucky five different ways and it all combines to tip you over the edge. Maybe you only need to fix one of them and you don't tip over the edge anymore." Is Alzheimer's disease a disorder of energy metabolism?